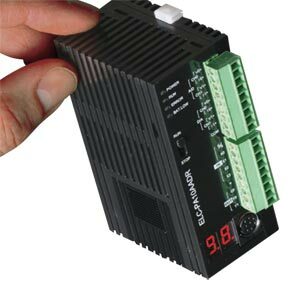 The ELC-PH12 model PLC provides high-speed pulse outputs which can be used to drive any of Omega's step & direction stepper drives. The ELCSoft ladder logic software has built-in step motor functions which make programming your motion control application easy. The STM23S-2AN is an integrated stepper drive + stepper motor which accepts pulses from a PLC. Add the ELCSoft programming software, ELC-CBPCELC1 programming cable, and OMPS150A24 power supply for a complete motion-control system that costs less than $1000. Order a starter kit! Includes an ELC controller, ELC graphics panel, power supply, cables, & software. See "Accessories" below. PLEASE NOTE: All of the PLCs require the ELCSOFT software and either ELC-CBPCELC1 or ELC-CBPCELC3 programming cable.